This coinage consisted of a small issue of farthings. 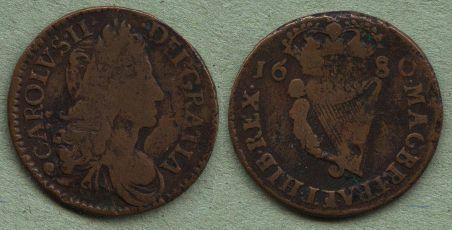 The issue was prevented by the Governor of Ireland in 1661 so the coins are quite scarce. Most pieces are 'coin struck' - i.e. the reverse is upside down compared to the obverse. However many pieces are 'medal struck' i.e. both sides are the same way up. As many records of sales do not include the die orientation of the piece it is difficult to establish a differentiation in pricing between the two types. The medal struck pieces are scarcer. A very scarce silver proof striking exists - These are 'coin struck' indicating the probable intention for the normal issues. The proof strikings are not often offered for sale and most examples are in institutional collections. These coins are commonly found with light corrosion. This must be taken into account in valuing a piece - pieces with smooth copper surfaces, free of corrosion and free of pitting from old corrosion, are more desireable. Pieces with corrosion need to be 'graded down' to allow for the reduction in value from the corrosion. The prices for VG below include the value of a piece with 'Fine detail' but light corrosion, and similarly the Fine price includes the value of a piece with 'Very Fine detail' but also with light corrosion. This coinage consists of a small issue of halfpence. There are varieties of both the obverse and reverse with large and small lettering. The change occurs between 1681 and 1682 and both types exist for each date. There are no mules of small/large dies, but there is a 1683 variety which has both sizes of letters mixed on the reverse - suggesting that the older large punches were used for the first few letters and then the correct small ones were used to complete the die. There are a number of minor varieties and there are proof strikings of some dates in Silver and in Pewter. These coins are relatively available in conditions up to Fine. Coins with no problems in strict Very Fine condition are scarce. Coins in Extremely Fine condition or better with original lustre are rare and do not appear on the market very often. As with all copper coins corrosion, or pitting of the surfaces from old corrosion, will tend to reduce the value and in general a lightly corroded piece should be valued below the value based on detail alone. Heavily corroded pieced are generally of little value. This coinage consists of a small issue of halfpence. It is a continuation of the previous coinage of Charles II. There are no significant varieties. There is a proof striking of 1685 in Pewter. The 1686 is the most common of the four dates - 1685 is almost as common. However 1688 is quite scarce and 1687 is rare. The difference in catalog values does not accurately represent the rarity of the 1688 and especially the 1687 coins.